How to chiffonade. Photo courtesy Marichelle | Lifeflix | Flickr. We so often recommend a chiffonade (shif-oh-NOD) garnish that we’re devoting an article to it. 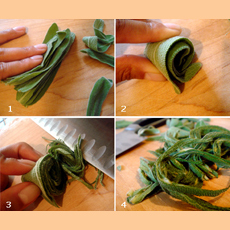 Chiffonade is a chopping technique in which leafy herbs or greens (basil, sage and spinach, for example) are cut into long, thin strips. Large, stackable leaves are needed—the technique doesn’t work with small leaves such as parsley or thyme. The word comes from the French chiffon, “little rag,” and refers to the shreds that this technique produces. It is also used to slice other foods (such as crêpes or thin omelets) into strips. 3. SLICE perpendicular to the roll. Use the chiffonade as a garnish or stir into eggs, salads, soups, stews, etc.